Would definitely love if you had recommendations for gender non-conforming, genderqueer, gender fluid, etc. too! I’m not sure if you knew this about me, but I LOVE making book lists. It’s a thing. And that Oprah gif just makes me laugh. Naturally, I asked first what she’d already read, so the list I put together isn’t the same. Here’s what she said. Also, at one point, I put together a list of YA fiction that deals with homophobia and transphobia, which can be found here. Don’t want to duplicate those, either. On that particular list are I Am J by Cris Beam and Luna by Julie Ann Peters. When I taught at the university, I had my students read I Am J, and many of them expressed surprise at their ability to identify with a character so different from them. One of the books on my gender non-conforming list is Lizard Radio by Pat Schmatz. It’s staunchly scifi. Kivali lives in a society that is very rigid, and governed by the all-mighty Gov. Kivali is a (gender) bender and doesn’t conform to society’s binary, which is unexceptable. She’s sent to CropCamp where she makes her first friends, has her first relationship, and has big decisions to make about where’s she’s going to go with her life. It’s an interesting look at being &/both in a world that is staunchly against it. And while Kivali’s storyline is interesting, readers are limited to the context of the camp, not seeing much of society outside those walls. One of my favorites, and I’ve talked about it before, is Freakboy by Kristin Elizabeth Clark. Freakboy is a novel-in-verse told from three perspectives: Brendan, a star wrestler who has it all, but sometimes feels like something’s missing; Vanessa who is trying to hold onto her relationship with Brendan; and Angel who befriends Brendan, but has some demons of her own. I appreciate the craft of this novel, Clark employs Ellen Hopkins-esque text features that keep the read interesting and fast moving. I also appreciate how readers have an opportunity to see Brendan wrestle (no pun intended) with his own internalized transphobia. I’m a big fan of the site Diversity in YA. 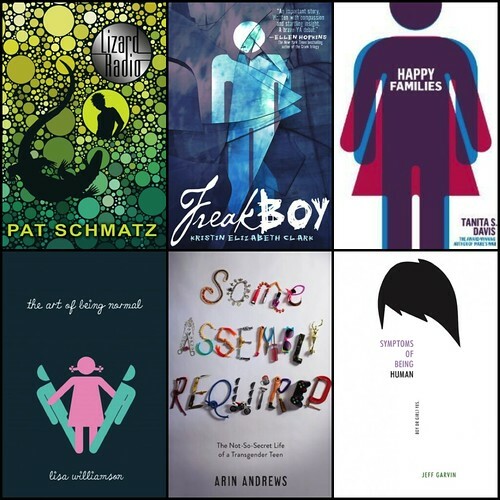 Two years ago, they made a list of books featuring transgender characters. Rather than reinvent the entire wheel (I came across the list after I’d done most of my writing), I thought I’d leave that list for you here. Also, there’s a list from February 1, 2016 in The Guardian that features 10 books about transgender characters by transgender authors. Naturally I found more books that I haven’t read than those I have, so here are the ones I’m adding to my TBR for the moment. One that caught my attention right away was For Today I Am a Boy by Kim Fu. I haven’t read many stories about transpeople of color, and Peter’s journey to become herself in the shadow of her traditional Chinese father intrigues me. I very much enjoy learning about the experiences of people whose cultures are different from mine. Happy Families by Tanita S. Davis is the story of twins Ysabel and Justin, two very successful young people who have well-adjusted lives. When their father reveals his secret, the twins have to come to terms with this change to their family life. I’ve read mixed reviews about this one, and really, I’m more interested in their mother’s reaction (probably because hers is the only one not in the blurb text). The reviews on Goodreads, taken with a grain of salt, are mixed. I think it was the cover that drew me to The Art of Being Normal by Lisa Williamson (I’m not immune). A friend of mine on Goodreads liked it, suggesting that the themes were universal and the characters were relatable (much like the commentary of my grad student who read I Am J). A friend of mine is reading Some Assembly Required: The Not-So-Secret Life of a Transgender Teen by Arin Andrews & Joshua Lyon. This one isn’t fiction, as I found out when I looked it up, but a memoir. The story of one woman’s transition as a junior in high school. The last one that I’m adding to my TBR at the moment is Symptoms of Being Human by Jeff Garvin. This one is about a gender fluid teen, Riley, who starts an anonymous blog to vent about what it’s really like to be gender fluid on the advice of a therapist. It provides Riley with a sense of community, until someone finds out who runs the blog and threatens to out Riley. So the question is: will Riley walk away from the blog and its community, or stand up and come out? One of the things I noticed, reflecting on this list, is it’s MTF heavy. I wonder if this reflects the balance of books with transgender characters. What books should we add to Tabitha’s (and my) reading list of books with trans characters?